I’ve always been fascinated by those in fashion history whose name and impact in fashion has been overlooked, forgotten even. One such figure is Carmel Snow, who during her time as Editor and Chief of Harper’s Bazaar was one of the most influential people in fashion. Snow is shown in figure 1, in the surroundings she most enjoyed, at the Parisian couture collections, in this case that of Dior, her steely gaze fixed on the model before her over the tops of her glasses. The aforementioned gaze, her secret weapon, knew a talent before a talent even knew itself and recognised some of the greatest creatives, whom she championed over the course of her career. But who was Carmel Snow? She began life as Carmel White, born in Dalkey, Dublin in 1887. Her father Peter died in 1893, when Snow was six years old. The family, over time, moved to set up a new life in America. Carmel’s first introduction to the world of couture came in the form of twice yearly trips to Paris, which were formative in her relationship with fashion. Paris, a chance meeting with a writer from Vogue and some note taking led to her joining the magazine in 1921 and becoming fashion editor several years later. It was during this time at Vogue that Snow was able to develop her unique ability to pick out talented individuals, even in the infancy of their career and when she met, married and had three daughters with George Palen Snow. In 1934, Snow became Editor and Chief at Harper’s Bazaar, taking over at the helm. Snow took control of the struggling publication and set it on course to be a front runner in its own right, directly competing with Vogue. Not a solo journey, she consulted with colleagues and the talented creatives she surrounded herself, to reinvent the publication. From her art director Alexey Brodovich, and his new take on layout, to Richard Avedon who brought his own style of photography, the collective of creators ensured Harper’s moved with the times, solidifying its position as fierce competition for Vogue. Examining Snow’s extensive career, one thing that stood out was the support she gave particular designers. In post-war Paris, she championed the talents who sought to reinvigorate the city’s couture industry. One such talent was Christian Dior, whose work Snow had encountered some years previous during his time at Lelong. Snow attended the February 1947 show, which represented the beginning of a new chapter in fashion. Of those that didn’t attend, Snow said “God help those who bought before they saw Dior. This changes everything”. (2) The term “New Look” is believed to have been coined by Carmel Snow, who exclaimed “It’s quite a revolution, dear Christian. Your dresses have such a new look”. (3) Snow used her magazine as a platform to promote Dior and his new style, which turned away from the austere looks of the decade. But it wasn’t just Parisian designers who caught her eye. Despite leaving Ireland, Snow maintained connections with her homeland. 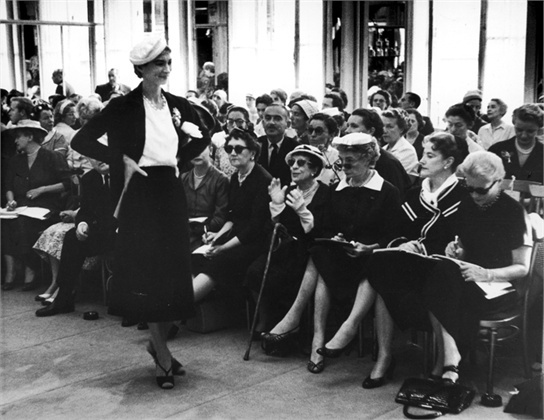 In 1953, Snow did for Irish designer Sybil Connolly what she had dome for many of her Parisian counterparts and introduced her to Buyers and the American press at a showcase held in Ireland. It was an opportunity for Snow to present the Irish fashion and textile industry to the world, just as her father had done in his work with the Irish Woollen Manufacture and Export Company. It was an opportunity for Connolly to reach out to audiences on the other side of the Atlantic, those which had a worldwide audience. 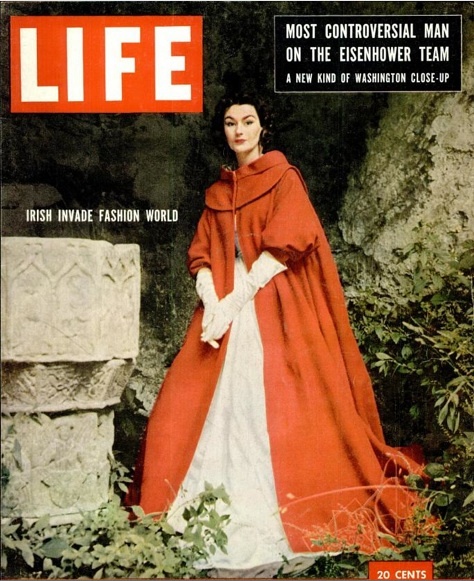 A Life magazine cover followed later that year, featuring a long red Kinsale cape and white crochet dress by Connolly, with corresponding headline “Irish Invade Fashion World”, shown in figure two. The editorship she described as a long love affair ended four years after this cover, in 1957, when she was replaced by her niece, Nancy, fashion editor at Good Housekeeping. This new appointment brought to an end a tenure that had spanned over two decades. What I find so fascinating about Carmel Snow is her connection to some of the most powerful names throughout fashion history, yet her name is less known. Snow was aware of the power of her support and patronage of designers whether it was through wearing their clothes, writing about them in her magazine or introducing them to those she knew. Her name carried weight. She threw this weight behind creatives, beyond those I’ve discussed. Today her story is discussed in relation to the aforementioned designers, as well as those who worked on the magazine, not the other way round. Perhaps this is how she would have liked it, the talents she recognized and supported being known, having the recognition she felt they deserved. 1 “Smashed on the Rocks of Fashion”. Irish Independent. Apr 30 2016. 2 Rowlands,Penelope.A Dash of Daring: Carmel Snow and Her Life In Fashion, Art, and Letters . Atria Books.2005. Figure 2, 1953 cover of Life magazine. Sybil Connolly red Kinsale cloak and white crochet dress.